As today’s the Life of Jalo shows, we got a new addition to our family a few days ago. Flatcoated retrievers have taken their place in our hearts and Luka is the third on in our household. What makes him special is that he is a yellow FCR. The breed standard for FCRs is quite clear in stating that the only accceptable colors are black and liver. Due to the history of the breed, the yellow recessive gene is probably quite widespread across different breeding lines. But because the breed standard doesn’t allow it, yellow flatcoats are quite controversial. This post is meant to clarify why we took a yellow flatcoat and how we feel about the whole matter. Before you read any further on why we chose a yellow flatcoat, read Mr Read Flower’s article on the matter (republished by the Flatcoated Retriever Soctiety, now from the Internet Archive) and an American breeders page about their yellow flatcoat (link currently not active). We (as in Anna and I) feel strongly, that the primary concern of any breeder is producing healthy offspring that conform to the breed standard as well as possible. However, with genetics being the game of randomness that it is, the best that we can expect from a breeder is responsible and informed decisions concerning the selection of parents. 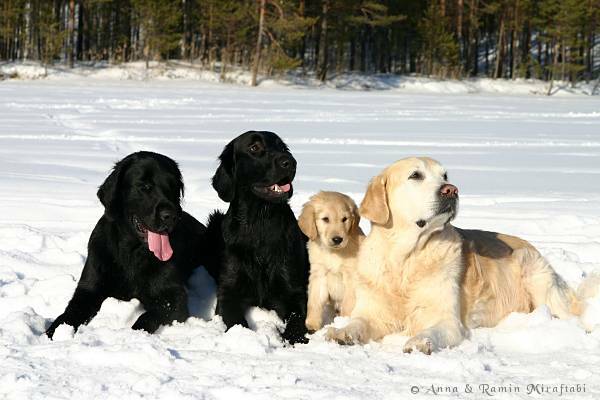 In some cases, such as with Flatcoated retrievers, there are genetic complications that do not conform with the breed standard. But the dogs health should be of paramount importance in any case. When we first heard of yellow flatcoats about a year ago, we were intrigued. Some quick research in the breeding database showed that since the mid-nineties only a few yellow flatcoats had been registered in Finland (11 before Luka’s litter). Rumours circulating in the Finnish flatcoat circles were also quite clear that breeders practised culling the undesirables. That was a fact that got us riled up and wanting to rebel a bit. Whatever the circumstances, we feel that a responsible breeder must not cull healthy dogs. In fact, in our book a responsible breeder is open and honest of the failures in their breeding programme. This includes sick or unconforming dogs. Not registering them and culling them from the start is just sweeping the problem under the carpet and keeping up appearances. It [yellow color] could probably be eliminated by a strict selective breeding programme. I doubt the result would be worth the effort, and who knows what we might lose along with the yellow factor? Although systematic eradication of yellow in flatcoats should be avoided, they are undesirable outcomes and breeding programmes should try to minimize their numbers. Because we wanted a yellow flatcoat at some point, now seemed like a good time when one was available. Another factor affecting our choice was the fact that we’ve been considering getting another golden retriever at some point. However, the more we see of the modern golden retriever stock, the more disappointed we’ve become. The same vitality that can be seen in Kassu and our flatcoats isn’t visible in younger goldens. Coupled with the fact that yellow flatcoats represent the history of both breeds, a yellow flatcoat seemed like a good choice in this light as well. We are opposed to any efforts to permit yellow flatcoats in the breed standard. Any breeding program that tries to promote a recessive gene will face serious problems and have a small pool of dogs to work from. Trying to promote the appearance of yellow would thus have a great chance of decreasing the general health of flatcoats. And again, we promote breeding that aims in advancing the general health and conformation to type (conformation to type in flatcoats requires good working skills). The only limitation that owners of yellow flatcoated retrievers face are their exclusion from dog shows. All other activities are open to yellow flatcoats even if champion titles are unavailable (due to the requirement of a show result in many champion titles). But when on considers the fact that of the almost 4500 flatcoats in the Finnish breeding database less than half have a show result better than sufficient. Which basically means that about half of the flatcoats have ever been to a show. All in all, while don’t advocate purposeful breeding of yellow flatcoats, we are not opposed to them appearing every now and then. We, as breed enthusiasts, can then go on to offer these dogs a good home and help them lead an active life as flatcoated retrievers (without show results). P.S. Luka’s pedigree is quite good, his sire’s sire (Almanza I Hate Mondays “Hector”) was the best of breed in Cruft’s this year. Hector’s sire (Almanza Far & Flyg) was the Finnish and Nordic winner last year (both shows we were at). Of course, both dogs have a bundle of other titles as well. 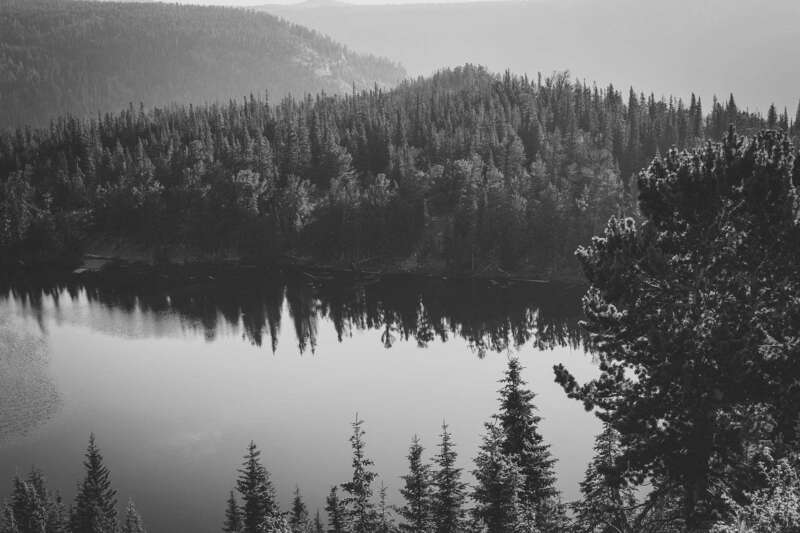 This post has been published in Finnish in Satunnaisia leiskahduksia. What is the difference between golden retrievers & flatcoats? I thought it was just colour, but if there are yellow flatcoats, there must be other differences. Hmm… This would almost (and quite well may) warrant a post of its own. From what I’ve read in several places, Golden retrievers were originally registered as Flatcoated retrieverrs – Golden. Golden retrievers were later (in the early 20th century) separated as a separate breed which then evolved with clear differences in type. Read the article by Mr Flowers for some further information. Various other sources also list the history of both breeds. Currently I’d say that goldens are heavier in build when compared to flatcoats. In temperament there are also some differences between the breeds. Flatcoats are happier and more active. They also have better working abilities, especially since flatcoats haven’t diverged into show and working lines. I’m sorry that approving this comment took so long. I was in a communications blackout due to work and we lost Kassu. If a Flattcoat pup is healthy,how dare a mere human play God and decide to take away that besutiful and brand new life? How can anyone take hold of a healthy pup and kill it? O.K., don’t breed for the colour, but when it happens, let it be. The powers-that-be have decided yellow Flatcoats offend their sight (and that is the only difference)couldn’t such a pup be offered for sale at a cheaper price and the purchaser sign a legal document promising never to breed from the dog and to have it neutered as soon as appropriate? Has anyone out there got a yellow pup for me? In the US, we still have lines of working strain goldens that very much resemble flat-coats in temperament, working ability, but aren’t yellow at all– they are reddish gold. In fact, I had a golden from working lines. She had an entirely flat coat and lighter frame with a much less exaggerated head. If she had been black or liver, you would have thought she was a flat-coat. But she was golden red. The reason why you are getting yellows in the flatcoated breed is because an important sire in that breed Don of Gerwn was derived from Lord Tweedmouth’s strain of wavy/flat-coats. He had a least one yellow ancestor. It is possible that other flatcoats carried the yellow/red gene into the bloodline. Originally, flat-coats , goldens, and labs were heavily interbred and registered based upon phenotype. Most labs have a flatcoat/wavy coat ancestor, but the gene for long hair has been systemically bred out of the lab. Goldens were considered a strain of wavy-coated retriever and were heavily interbred with black wavy-coats (in fact goldens have more black wavy-coated and flat-coated ancestors than yellow and red ancestors). If you look at goldens from the late nineteenth century and early twentieth century, when they were part of the flat-coated breed, you can see a similarity. Also, all flat-coats are derived from wavy-coats. When you see wavy-coat in a breed book that means flat-coat. It was decided in the late nineteenth century to breed the wave out the coat. You sometimes see the flat-coat with a wave. I don’t know why they decied to separate the golden from the flat-coat. It actually sounds silly, because the breeds in their original form were nearly identical. I suggest maybe one day opening up the registry between the breeds to allow goldens to gain some more working ability and for flat-coats to get some new genetic diversity. I would suggest this happen the way that the Belgian shepherd breeds are interbred. I think that our dogs would do better with more open stud books. I’m deeply afraid that golden retrievers are going to lose their working ability, and that flat-coats are going to fall into cancer ridden messes. Both breeds deserve better than that from us, don’t they? Maybe these yellow culls from flat-coats could be used in the golden retriever gene pool (after all, that’s what a golden retriever originally was– a cull from a black flat-coat/wavy coat breeding program). My golden retriever Nala passed away a week ago. She had a flatter coat and was reddish-gold( http://www.geocities.com/acvrebel2/nalafall.jpg ). My mother and I are hoping to get a flat-coat puppy. My friend’s flat-coat Molly is due in March; hopefully the puppies haven’t all been spoken for. I would love to see a yellow flatcoat! Any good pix out there? My beautiful boy Jett was a stellar looking black flatcoat. He will be greatly missed! I am interested in finding another (never will he be replaced) flatcoat and the idea of a yellow intriques me. I would not think of breeding him, but would love to spoil the daylights of of one of these rare breeds. my Golden Retriever Boris passed away a week sago. The reason you don’t see yellow flatcoats in the ring (other than the breed standard prohibition) is that the golden retriever was developed from 4 yellow flatcoats along with a tweed spaniel and some other now defunct breeds. The golden was developed more for the gentry, land owners of the late 1800’s and the flatcoat (formerly called the wavy coated retriever) was used by game keeper. The golden have a more laid back temperament making them easier to live with. The flatocat is the “Peter Pan” of the dog world and never truly grows up. Of all the retrievers, they have the best nose and can handle the best variety of game. Flatcoats are aware of everything in their environment and if something is only slightly out of place, they need to explore it and make sure it is OK. All goldens want to do is please their owners and cause no strife. Me personally, I could not live with a golden. I am a flatcoat girl all the way!! Regarding yellow flatcoats, it is a non-leathal recessive gene. If you bred a black to a yellow, all the puppies would appear black, but carry yellow. All of these puppies, when old enough and passing all their clearances, would need to be bred to dogs that were pure for black, again producing an all black litter. Following the same pattern as before, the yellow color could be bred out of this line in about 8 generations. It seems a pity that a perfect specimen of a dog who has all the clearances, wonderful conformation and good working ability can not be used in a breeding program as long as the proper color testing was done. Color is not a health issue and does not affect longevity. The flatocat breed has much more pressing matters to address than the color gene. your website and pictures are wonderful. We own 2 golden (Caju male 1 year, and Vanille female 2,5 years) and try to get results both in shows and working. We love flat coats that we see very ofen in trainings. In France there are only about 200 pups per year, and breeders have sometimes difficulties to sell them. Before adopting Vanille, I was interested to get a flat. When once I asked what were yellow flats on a forum, breeders on this forum were very unpleased. I’m against breeding just for a color, and I hate what some breeders did with those white goldens, only made for shows. But since yellows flats are not in the standart, some breeders just give them or worst kills them. may this reduce the genotype of the breed ? Breeding is only a human way of animal evolution. Sometimes we can do mistakes. Good to see that some people think different that standard. We have flats over 20 years, live in holland and we have had a replaced flat with the wonderful color yellow.We knew they eccist, but by asking we always heard, not with us, and they laughed at us. He was 4 when he arrived. after his death last year, he died of cancer at the age of only 10, we tried to find a yellow again. But Bob a liver came.My husband sais often, when you find a yellow, he or she may live here with us, so I searched the web and I found a litter in Finland with 2 yellow pups. Unfortunatly the breeder let the litter sleep for ever, because after DNA he found out the father wasn’t the father. The end of our dream. Bob is now 15 month. Our black girl is 8years and has cancer also, so we tried to find a pup again, but it is not easy to find a pup, but last thursday I traveled to Belgium and now Bas is living with us, not yellow but blacker than black. If somone find a yellow flat, think about us, we have lots of space and give the flat a wonderful live.Our yellow Gijs had a wonderful caracter and was absolutely a flatcoat.Once a flat, always a flat, what color it has is not important. sorry for my english, and have lots of fun with your clowns the flatcoat. Cant understan why the beutiful yellow is banned. The labrador is availble in all 3 colours! How can we make the yellow accepted? 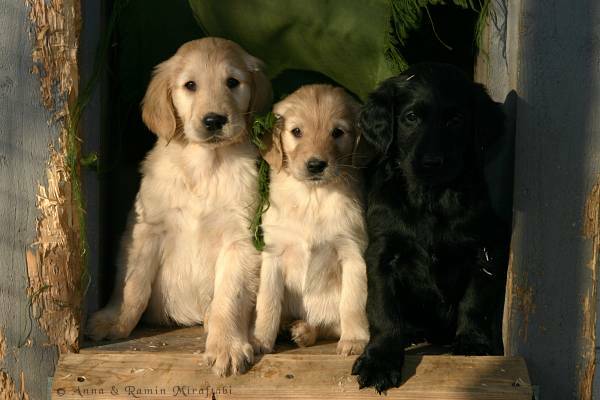 Thank you for posting photos and information about yellow Flat Coated Retrievers. We now are fortunate to have one black female, one liver male and one yellow male Flat-Coat. Our yellow puppy is just only 6 months old. We were glad to learn more about them through your website. I had a black flattie/golden mix, I think her grandmother was a flattie. In her litter, there was only one golden puppy, and the rest were black – the breeders did not want the black puppies, so they advertised in the paper that they were giving them away for free. Those people with the gold flatties could have at least done that, instead of killing them. Now my head is spinning. How are people finding these yellow flat coats? There are a few out there, but again it is very few from the looks of it. Since nobody advertises their yellows since it is a “disqualification” I am having a hard time finding one. I for one would love to have a yellow flat-coat and liver flat-coats, there are too many blacks these days, we need to keep the genetic variety with the limited gene pool. I realize the decision was made near 80 years ago when breed standard was written was only to separate the golden retriever which were mixed, and the lovely flatties. It needs to be overturned especially if they are healthy dogs and I wish to rebel a little. I also hate the thought that these poor things are being culled. Could you give me more information on where your yellow flat coats were found? Are they certified as purebreds? I found your discussions when I was searching for more information about the yellow flatcoats. At the moment we have 4 yellow, healthy pups who are sleeping i our livingroom… We have kept them all, as well as their black and liver sisters and brothers, and we hope we will find decent homes to them. We are actuelly so fond of the yellow ones that we have decided to let one of them stay with our family. First, Sara, we would love to adopt one of the yellow pups, would prefer a little girl. Our beloved flatcoat Ceilidh (Kaylee, for those of you not Celtic), succumbed to bloat in mid-December. She had the sweetest personality of any dog we’ve ever known. We originally wanted a liver boy, but when we met her, we knew she was a perfect match for us. Breeding only to breed standards is a shameful practice. Killing yellows should be a criminal offense. I have no problem with people owning yellow flat coats (why would you kill a healthy puppy?? ), but like you have perfectly written I wouldn’t encourage breeding them. If a breeder ends up with a yellow flat coat then just give it to a family that will spay or neuter it. I worry that encouraging purposeful breeding of yellow flat coats will not only end up with some undesirable recessive traits, but encourage unprepared people to pick a flat coat based on looks alone. A flat coat is not a golden retriever! Flat coats are beautiful wonderful dogs for the right people (people that will give them the exercise and mental stimulation they need!) Goldens seem to be so over bred by less than desirable breeders not determined to improve genetics or the breed. I got my flat coat from a woman whos family had started breeding them since she was a girl. She was absolutely dedicated to the breed and the health of her puppies. She made sure we met both parents, showed us the health screening they had received, and made sure we knew our stuff. It was like being interviewed for a job! She also made sure that we spayed our puppy and said that if we ever had to give her up that she would take the dog back and find her a good home. Unfortunately that breeder died of cancer a few years ago. Speaking of cancer, my flat coat got osteosarcoma in her jaw and received a mandibularectomy. It’s been almost two years since then and she is still happy go lucky. She doesn’t care that it looks like her jaw is dislocated, she still wants to fetch! I used to own a yellow flatcoat and Golden Retriever and may i just say the flatcoat was full of energy to the end while the retriever seemed to mellow out at the age of 2. I certainly loved him. Just today I was walking both my 8 month old black flatcoats and came across a woman who had 2 yellow flatcoat pups, here in toronto they seem to be around as they arent the first yellow flatcoats ive run into recently. Live on yellow flatcoats!! Hi Guys, my friend and I are small breeders of pedigree, show and working flatcoats. We got a big surprise in our latest litter. There was no in-breeding at all involved, and nothing like it in previous litters – but we have a ‘diluting gene’. So one male is charcoal grey and 3 females have dark grey tails. They are growing well and are as healthy as the others. We tested for everything we knew to test for. How come we didn’t know about this?? How common is it? Anybody know anything? Or is this another situation like the yellow – cull and keep it secret? looking for informatioin about flatcoats, I found your website and the pictures of your Luke. I saw just one yellow flatcoated in my life before. On shows and working tests you see just liver and black ones. Do you know how many yellow flatcoats are registered worldwide? In the article I read a number of 11 in Finland. In Germany I know there are 22 yellow flats are registered since 1988 at the German Retriever Club, the only FCI accepted flat breeding club. I had two yellow Flatcoat puppies in a litter some years ago and I never considered culling them. In fact I sold them for the same price as the black puppies with a breeding restriction on their pedigree. They were the first puppies to be chosen and both went to pet homes. I think it is sad that a few people many years ago decided to ban the yellow colour as it has led to healthy dogs being culled. Although I only know of one person who said they would cull yellow puppies and I think most breeders would simply find them pet homes. I hope one day the breed standard will change. They are all Flatcoats whatever their colour. Previous Post Miksi keltainen sileäkarvainen noutaja?